For more than fifteen years, October 30th has been recognized as Create A Great Funeral Day. This is a day that is dedicated to talking with loved ones about how they want to be honored. In 1999, Stephanie Allen West watched her husband struggle to make arrangements for his late mother. Her mother in law had not left any wishes, and her husband was left to wonder what kind of things should be included in the service. Stephanie witnessed this and knew that her husband could not be the only person to ever experience this. It was after this that Create a Great Funeral Day Was born. The idea behind the day is to have loved ones start a dialogue and let others know what kind of service they want when they pass away. Too often, people do one of two things when it comes to talking about final wishes. The first is, they don’t say anything. This means their loved ones are left having to deal with additional stresses during an already emotionally difficult time. Burial or cremation? Funeral or celebration of life? Where should the reception be? These are all things that families have to figure out when a loved one doesn’t leave instructions. Even worse than this though are the people who say “don’t do anything”. Some people have the mindset that because they won’t be there (sort of) for the service, their family should not worry about doing anything. In reality though, this may be considered pretty selfish. A funeral is not for the deceased, it’s for their family and giving them the opportunity to share memories and say goodbye. It can be challenging for some people not to do anything to acknowledge the loss of a loved one. Although you may not want your family to worry about making arrangements, doing so can be therapeutic and help them manage their grief. This year on October 30th, the ObitTree team is encouraging everyone to take part in Create A Great Funeral Day. You don’t have to spend anything or go anywhere. All you need to do is talk with your loved ones about your end of life wishes. Just let them know how to pay their respects when you pass away. While it may be difficult to talk about this, you’ll be glad you did. If you want some help getting started, check out our Talk of a Lifetime blog post to get some more tips. 1.) Research the different options available. Before you talk about your final wishes, take some time to look at the different methods of disposition and types of services available. By taking the time to do some research before your talk, you can begin to think about what your ideal service should include. 2.) Think about how the service will help your family. Remember, the service isn’t for you, it’s for your family. After the loss of a loved one, everyone is overwhelmed with grief and trying to work through their emotions. Think about different ways the service could help bring closure. Everyone’s life changes after the loss of a loved, the service should be one of the first steps down this new path. The service may be for your family, but it’s about you, so personalize it. Everyone’s been to a service before that’s generic and dull. What are some of the ways your service could reflect what made you unique? Maybe there’s a theme, specific music, or favorite dishes that are served. 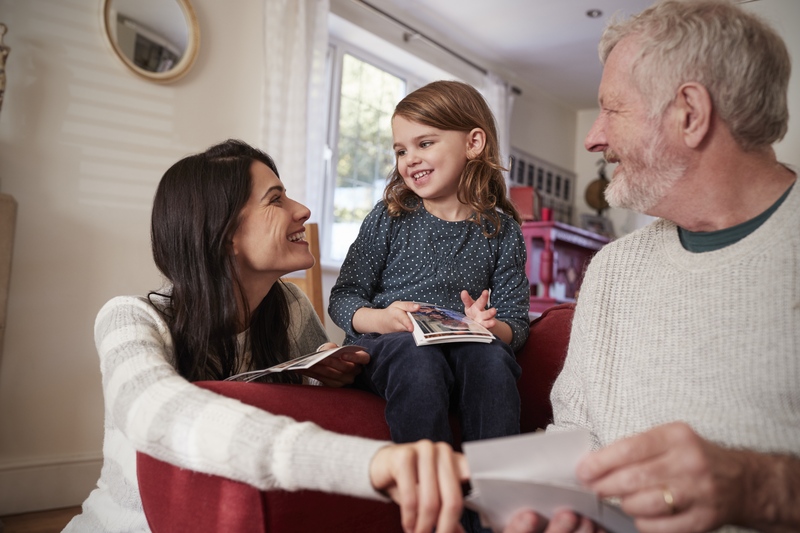 Help your loved ones feel connected to you by including these elements that highlight your individuality. Now that you’ve taken the time to do some research and think about how you want to be remembered; talk to your family. Sit them down, take a walk, just do something to get the conversation started. Tell your loved ones the things you want to be included and the things you don’t. While they may not realize it right away, they’ll appreciate this help when it comes time to make arrangements. Many have even said that having the talk brought them closer to their loved ones. 5.) Meet with a funeral director. Last but not least, talk about your final wishes with a local funeral director. Many people choose to take the next step and prearrange the service themself. Doing so provides you with peace of mind that your final arrangements are taken care of. It also allows you to give your family one last gift, as they will not have to worry about making the arrangements and can instead grieve and comfort one another. This entry was posted in Funeral Planning Resources, Industry News on October 25th, 2017 by ObitTree . Hey, I am really impressed with your thought. You’re doing amazing job. These five steps is the best way to capture all the moments and memories.